Students from overseas countries are accepted for elective training programmes at CMC for up to a maximum of 3 months. Every year about 1,000 applications are received from medical students and 100-150 come for training either as elective students or as student visitor observers. A formal permission from the Medical Council of India and the Ministry of Health, Government of India may be necessary. The specific application forms for this purpose may be obtained from the Principals’ office. Obtaining permission takes approximately 4-6 months. The dates given in the elective application cannot be changed without further reference to the Medical Council. If the permission is not obtained in time from the Medical Council of India, and the Ministry of Health, students could still come as “visitor student observers” provided they do not require official certification for the student elective period. Visitor student observer placements are for up to four weeks. It may be possible to arrange for another two weeks in a nearby Mission hospital on arrival in Vellore. Elective students may be posted to various clinical units/departments of their choice to participate in ward rounds, clinics, demonstrations, lectures and seminars. However, they will not be able to take part in direct patient care. Many overseas students are interested to see Primary Health Care in rural settings and this could be arranged in the departments of Community Health and Development (CHAD) and Rural Unit for Health and Social Affairs (RUHSA). Students of other disciplines such as occupational therapy and physiotherapy are also accepted for elective training. Candidates wishing to come for any of these programmes may write to the Principal, enclosing a letter from the Dean of their school. Postings are arranged by the department concerned. When organising an elective placement, bear in mind that April to August are the hottest months of the year in Vellore and accommodation can difficult in August due to Alumni batch group reunions. 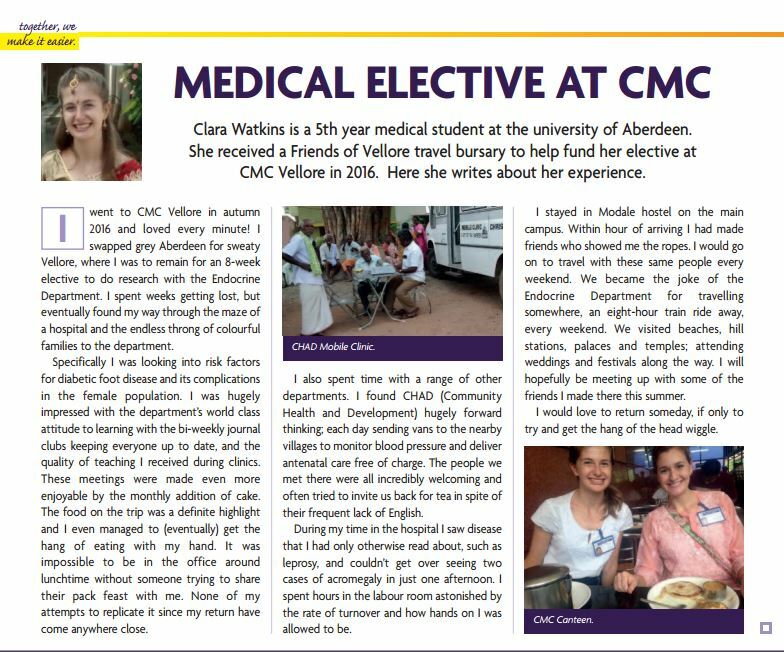 If you do arrange an elective placement at CMC, please let the FOV UK office know. We would love to hear about it and link you up with other friends of Vellore here in the UK.